If your employment allows you to use the benefits of some of the companies listed below, you can apply your benefit credit in our salon. You can use the special card that you received from the employer, or purchase in the e-shop of these companies, in the so-called benefit cafeteria. How to proceed with this type of employee benefits can be found in the following overview. Come to a massage with your card. If you accidentally forget the card at home, all you need to know is the information on this card. Tell us your card number. 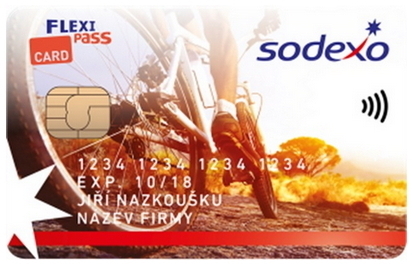 Unfortunately, our payment terminal does not support Sodexo cards, so we will authorize the payment using e-sodexo.cz system. You will receive an SMS. Sodexo will send you an SMS to secure the transaction during payment. Enjoy your massage. Nothing more is needed, your benefits points will be deducted from your card according to our pricelist. Make an order to draw benefits. Benefit Plus will guide you through the individual steps of your order. Your confirmation will arrive by e-mail or SMS. Visit our salon. Book a date for your massage and visit our salon. At our reception desk, submit your order or e-voucher in SMS and we will ensure payment authorization. Come to a massage with your card. If you accidentally forget the card at home, all you need to know is the number of your card. Tell us your card number. We will take care of payment authorization at Benefity-plus. Enjoy your massage. Nothing more is needed, benefit points will be deducted from your card depending on the length and type of massage in our price list. Find us in Benefity Café. Sign up for a cafeteria at www.benefitycafe.com and find our salon. Buy an E-ticket. The app will guide you through the purchase of the E-Ticket, which you can use in our salon. Visit our salon. Book your appointment in advance and visit our salon. Tell us your E-Ticket code and we'll take care of its validation. In a moment you can enjoy your massage. Come to a massage with your card. Pay by your card using our payment terminal. Just like your bank's credit card, you can also pay contactless. Find us at Benefity.cz. Log in to the Benefity.cz and find our salon. Make a massage payment. Pay the amount of your massage. The amount will be charged from your benefit points that your account currently has. Visit our salon. Make a reservation with us and visit our salon. Just give us the transaction number from Benefity.cz. We recommend to enter the transaction number when ordering your reservation, so we do not bother you before the massage. Tell us your card number and a part of your PIN. To keep your card secured, you do not tell us all your PIN. Our receptionist will ask you for the specific two digits of your PIN. Enjoy your massage. That is all. Depending on the type and length of your massage, your card will be automatically charged the appropriate amount for massage. Prepare your membership number. The number was given to you by the employer or you can find it on your Le Chèque Déjeuner card, which is linked to Gallery Beta. Visit our salon. Order the date of your massage and visit our salon. At the reception desk, please provide your membership number and a part of your PIN, which our receptionist will ask you to. We will take care of payment authorization, you can enjoy your massage.